Launched in the US in April 2006, the Pixel® 2940 laser device from Alma Lasers (distributed in the UK by Advanced Beauty Cosmetics Ltd) uses fractional ablative technology for the treatment known as fractional laser skin resurfacing , aimed at rejuvenating aged and sun damaged skin with less downtime than normally associated with traditional ablative laser skin resurfacing procedures. The Pixel® 2940 is a laser hand piece (see photo) which emits a 2940nm Er:YAG (Erbium Yag) ablative laser. Ablative or skin resurfacing lasers, such as carbon dioxide (CO2) and Er:YAG lasers, briefly direct an intense burst of laser energy onto the surface of the skin. This energy heats water within the surface layers of the skin, causing both the water and the tissue of the skin to turn to vapour. Every time the laser passes over the skin, some of the outermost layers of the skin are removed in a precise and controlled way to the appropriate depth. The Pixel® 2940 hand piece is designed to be incorporated as part of Alma Lasers’ Harmony® multi-application laser platform. The Pixel®’s 2940nm Er:YAG ablative laser is delivered to the skin through a micro optics lens. This creates 49 (7x7) or 81 (9x9) pixel sized ablation dots on the skin (see photo), within an 11mm x 11mm treatment zone, which each penetrate between 20 – 50 microns deep, (a micron is one millionth of a metre). The practitioner can decide between the 49 and 81 pixel configuration, depending on the area and type of treatment required. With the smaller 49 dot pattern, the energy is split between fewer pixels, so each pixel receives more energy and the depth of penetration is higher than with the 81 dot pattern. 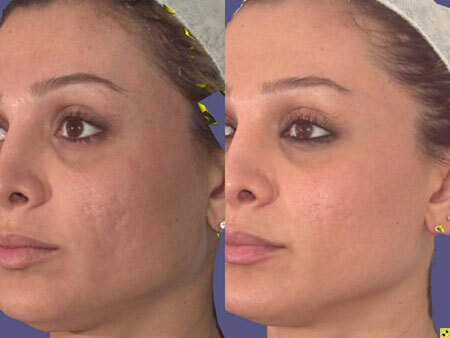 Unlike with traditional ablative laser resurfacing which removes the whole of the top layer of skin in the targeted treatment area, this fractional method damages only certain zones within the selected target area, (producing tiny white dot, or pixel-like treated areas on the skin), leaving the other zones within it perfectly intact. Therefore only treating approximately 20% of the skin within the treatment area. This allows the skin to heal much faster than if the whole area was treated, as the ‘healthy’ untreated tissue surrounding the treated zones helps to fill in the damaged area with new cells. This causes collagen remodelling, skin tightening and an improvement in skin texture as the area heals. Unlike some other fractional laser skin resurfacing machines used in the UK, the Pixel® 2940 device doesn’t require single patient disposables such as treatment tips, optical dyes and gels, which helps to make the treatment both faster and cheaper for the practitioner and client. A treatment session for a full face will take approximately 15 minutes, with hands taking approximately 10 minutes. The Pixel® 2940 was cleared by the FDA (Food & Drug Administration) for fractional ablative laser skin resurfacing in 2006 and also recieved the European CE Mark in September 2006. The Pixel® 2940 machine is used for the treatment known as skin rejuvenation, which includes; the reduction and possible removal of fine lines and wrinkles, improvement of deeper wrinkles, repair of sun damaged skin, the reduction of age spots and blemishes, acne scars and hyperpigmentation (areas of darker pigment or brown patches in the skin). However Pixel® is not suitable or safe for use on all skin types, and therefore cannot be used on those individuals with Fitzpatrick skin type VI; i.e., very dark skin tones such as Afro-Caribbean and African black skin. The longevity of results is comparable to ablative laser resurfacing and as always is dependent on future ageing, the effects of gravity and sun exposure. The Pixel® 2940 machine offers speedy healing and minimal to no downtime. Treatment is generally considered to be well tolerated and almost pain free, with a light flicking or ‘elastic band’ feeling on the skin as the laser is fired, and some sensation of warmth felt during treatment. The treatment of deeper wrinkles and scars may produce more discomfort and heat effect, but your practitioner can manage this effectively for you if necessary. Some may use a cold air device to aid any discomfort felt. 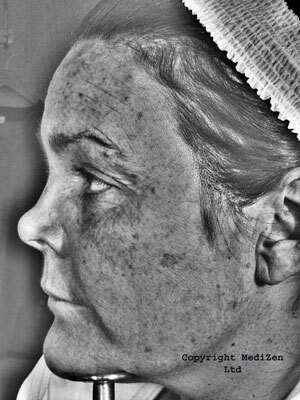 The manufacturers claim that the Pixel® 2940 delivers results on par with traditional ablative lasers, but that it eliminates the possible side effects associated with such traditional ablative methods such as hypo- or hyper-pigmentation (dark or light patches forming on the skin), post-procedure infections, swelling, erythema (redness) or oedema (swelling caused by inflammation). Immediately following treatment, the skin may feel tighter or firmer, and have a smoother feel to the touch. Some minor redness (like sunburn) and skin flaking (from the dots) can be expected in the days post-treatment, similar to a superficial chemical peel, but with no pain or discomfort expected. Cooling gels or aloe vera may be applied to the treated skin to reduce the redness, which should resolve in 24 – 48 hours, depending on skin sensitively. It is also advisable to apply sunscreen to the treated area. Most people can return to work almost immediately, and in the case of women, any residual redness can easily be covered with makeup. Unlike the Fraxel® device, there is no temporary ‘bronzing’ effect on the skin post Pixel® treatment. A treatment programme of 3 – 5 treatments, spaced 1 – 4 weeks apart is recommended by the manufacturers to achieve the best results for indications such as sun damage, acne scars, enlarged pores and rough skin texture, fine lines and pigmentation. Costs forPixel® 2940 treatment depend on the area(s) being treated and can start from approximately £300.00 per session for a full face treatment. Scarring on face before treatment. 30 days after second Pixel treatment. Images provided courtesy of ABC Ltd. 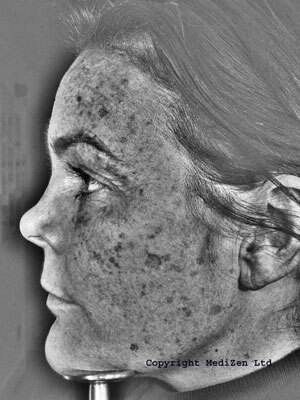 Female face with mottled pigmentation, shown with UV camera before treatment. Improvements following a single PIXEL treatment shown with UV camera. 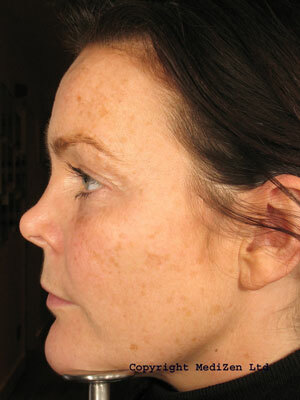 Female with mottled pigmentation cause by sun damage, before treatment. 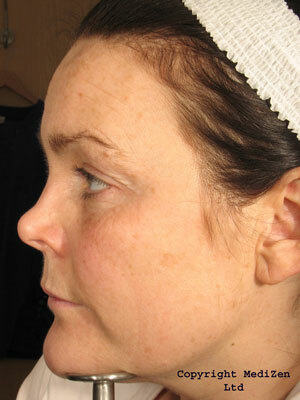 Reduction in pigmentation following just one treatment with PIXEL. Gregory S. Keller MD FACS, Clinical Associate Professor, David Geffen School of Medicine, University of California, Los Angeles, USA. Click for ALL Pixel ® clinics in the UK & Ireland registered and verified by Consulting Room.